Offering end of chain sale this two bedroom detached bungalow set in cul-de-sac position is ideally situated within walking distance of local shops and bus route. 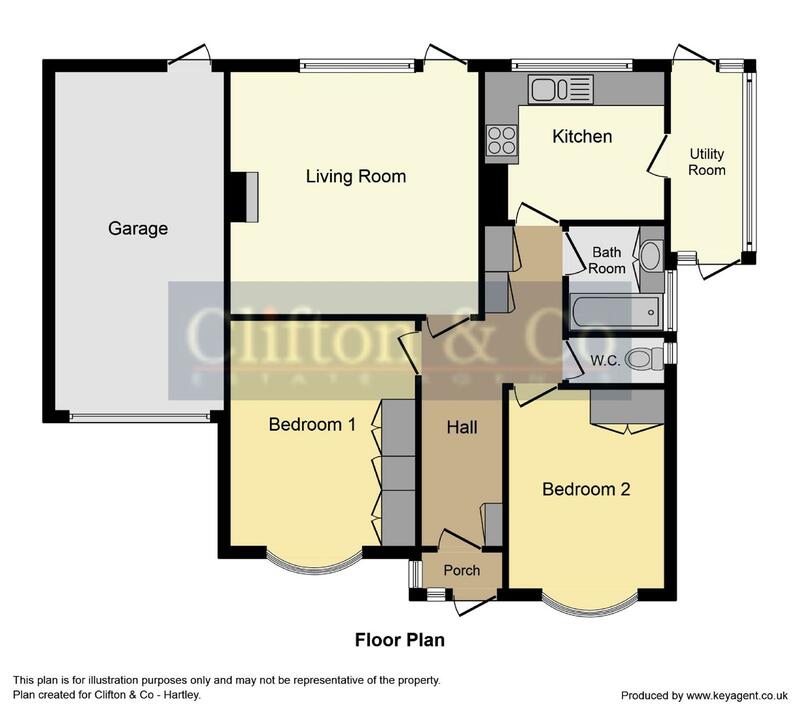 The property offers double aspect lounge with French door opening onto rear gardens, there are two double bedrooms, kitchen, bathroom and separate wc. The property offers gas fired central heating. Outside there is driveway parking leading to garage and well stocked secluded mature rear gardens. Hartley lies in the northern side of the North Downs between Sevenoaks, and Dartford/Gravesend. The thriving village offering local shops and two excellent primary schools, Black Lion public house and superb Hartley Country Club offering a variety of sporting activities. The village of Longfield offering further shopping facilities and mainline railway station with services to London Victoria. Road links from the area give access to A2/M2, A20/M20, M25 and Dartford Tunnel as well as the Bluewater Shopping Complex and Ebbsfleet International station providing a 20 minute link to London St Pancras. From Clifton & Co proceed along Church Road taking the second turning left into Gresham Avenue. Follow the road down turning left into the cul-de-sac where the property will be found along on the right hand side. Access to loft space. Cloaks cupboard. Separate linen cupboard. Radiator. 14' 10" x 14' 10" (4.52m x 4.52m) Double glazed window and door opening onto rear garden. Four wall light points. Radiator. 13' 4" x 9' 12" (4.06m x 3.05m) Double glazed bay window to front. Built-in wardrobe cupboard. Radiator. 11' 6" x 9' 6" (3.51m x 2.90m) Double glazed window to front. Built-in wardrobe cupboard. Radiator. 10' 4" x 8' 5" (3.15m x 2.57m) With double glazed window to rear. Door to conservatory. Comprising single drainer sink unit with mixer tap. Cooker point. Storage cupboards. 10' 5" x 4' 1" (3.18m x 1.24m) Pluming for automatic washing machine. Door to front and rear. Window to side. Comprising panelled bath with mixer tap and hand shower. Vanity wash hand basin. Radiator. With patio area leading to gardens laid to lawn. Flower and shrub borders. Screening, fences, hedges and trees.